You know that thing that lies above our heads and tends to threaten us every day, let alone the heroes of JRPGs and the occasional western RPG? Yes, the threat of our world ending, not in the metaphorical sense of the word where life turns to shambles where there seems no hope for recovery for us. No, we are not talking about existenstials crisis' or anything overly sensitive and personal like that. We are talking about the actual world, planet, earth and oceans we all share in our close-knitted communities we've build in the vast amount of metropolitan cities, small towns covering the surface, all being utterly wiped out. It's a thing we've feared and still fear to this day that our lives might be put to an abrupt end due to unforeseen circumstances that are out of our control--Something we couldn't have prevented in any way. Well the thing about world endings is that they generally are caused by something, whether it is us indirectly pulling the trigger through destroying the planet we live on with little regard, or whether it is us setting off nukes. In case of Shin Megami Tensei, it is both human interference, as well as nature taking its rather odd course? Nocturne isn't a game for mincing words, in fact very little words are spoken in this game beyond the vast amount of faceless NPCs you talk to and that's part of its charm and thick-skinned atmosphere. It does something that games like Dark Souls and its ilk have since popularized, it leaves the storytelling to that of its environment and the accompanying music spelling out the dread and loneliness of an empty void that used to be the world we knew. Initial impressions might turn people off the game but the intricate art design of this game makes for a world that is interesting to explore, even compared to games made today--Nocturne still looks great. The most shocking thing about it though is it barely occurs not even an hour into the game. 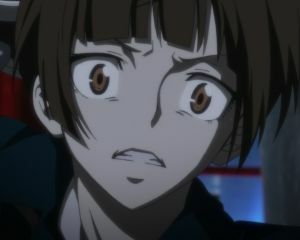 All you can do is bear witness to the end of your modern day life as a high school boy in the sprawly metropolitan Tokyo, as your Homeroom Teacher tells you cryptic nonesense about the rapture, then invites you to come to the Hospital roof and see the fallout. It's one thing to talk about the threat of the world ending, it's another to actually bear witness to it, whether it be in the game or not. We've always been comfortable with the scenario of saving the world, but there is no saving the world in Nocturne. Only rebuilding it from scratch. And that music, really. The fact that we as players get to explore the city of Tokyo, before this catastrophe unfolds, only serves to make the weight feel even heavier than it does in most games. You spend the first part of the game, getting somewhat free roam to explore a few intregral blocks of the city, which you'll get to acquianted with yet again after all of the destruction is over. It makes the stakes and the impact of it all hit harder than it ever could in any Fallout games. And speaking of Fallout, Nocturne draws a lot of inspiration with its storytelling from western RPGs particularly with the presence of factions and having your alignment/choices affect the outcome of the story. There is a lot to like about the world of Nocturne beyond it being grim, and this scene is just the beginning. Understanding all of this so far will probably raise some questions like why is it that something as hopeless as the world getting destroyed is presented to us so early? 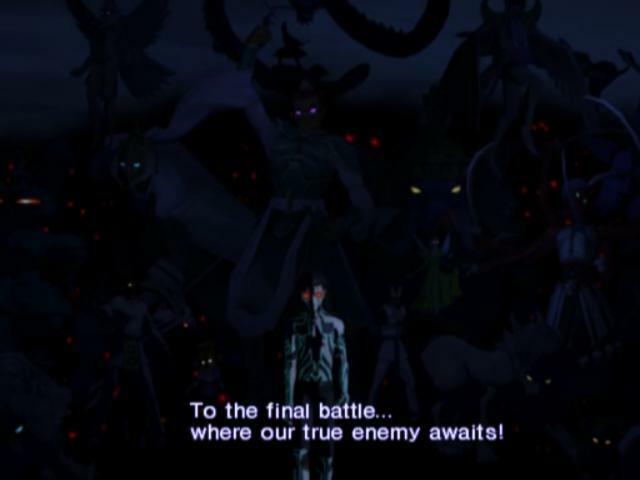 Well approximately halfway through the game, and as you beat more of the Fiends whom Lucifer sends to kill you, you get told about the functions of the Amala Universe, which is one giant universe in a network of others that basically exists to characterize the connection between Shin Megami Tensei Nocturne and the various of other titles in the series and its spin-offs. 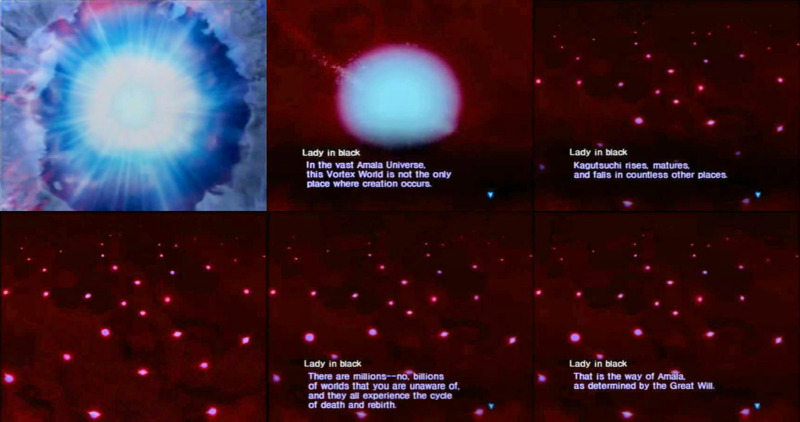 You are just one single ant, in one universe, among thousands of others that goes through the same cycle of Rebirth, Extinction and So Forth, almost sounds familiar to that of what I talked about with the Reapers in Mass Effect. 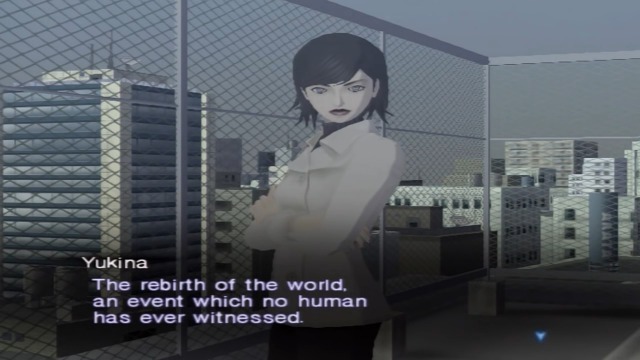 In case of Shin Megami Tensei, the apocalypse is synonomous with the series overall premise, even in those spin-offs where the setting isn't a post apocalyptic wasteland like Strange Journey it still looms over the heads of the cast as something that will happen. God is real in this universe, but naturally he doesn't really have a face, as it is presented with regards to SMT that all mythological beigns and gods exist but only as far as people believe in them. Folklore beings like Aradia are branded "false gods" because they exist in a world that hasn't achieved creation, the Shadow Vortex Worlds, and mostly because nobody believes in them and thus they've failed to make a contract/Reason with any human sponsors--In other words, they don't exist or at least they are not supposed to exist in the real world beyond the folktalkes. In the world of SMT, the myths of deities, folklore creatures, and even Judeo-Christian Angels are real and demons take their shape. The Angels see themselves as different from the demons, and the demons do the same because the angels generally serve "God" whom they oppose. These demons exist on something called Magatsuhi, which is energy born from strong human emotions. Much like our world, the gods are human constructs that serve to give us belief that there is a higher purpose to our very existence. 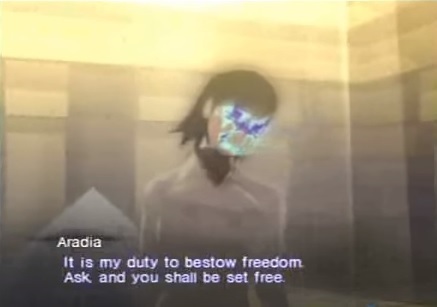 In SMT, these gods are demonic monsters that take form along the strings of these beliefs. And as much as these demons need humans to believe in them to exist, they also need them to spin along the wheel of creation. Only a human can form a Reason according to various characters in the game. So in other words, the Conception is also a human contruct. And knowing that the entire adventure from your casual strolls in Tokyo and searching for your teacher, to trying to survive and coming out on top in the apocalyptic aftermath is all just part of a grand design that has repeated itself, and continues to do so in countless of other similar realities--It's what sets the game apart from other RPGs of its ilk, and puts in a somewhat similar category to the western RPGs from where it draws inspiration. While Atlus has married themselves off to a consistent concept of psychological horrors borne from the human condition. Only with Shin Megami Tensei, and particularly Nocturne, do they refrain from having endings that feel any less than hopeless if not grim. The world of Nocturne is one where the seemingly sincere and well meaning people are fools, sycophants and ultimately cause more harm than those who value strength and conviction like the Devil himself. The wasteland of the Vortex world is populated by NPCs, factions who are all out for themselves or their own. It's jungle rules, where only those with a strong principle can persevere. And the scene where the Conception occurs capitalizes this, it sets the stakes for the tone and type of harsh game that Nocturne is--Even as you are unwillingly infected with a parasite through your eye by the Devil who among many others is just using you for his own ends--It's an attest to the game's strong and weird form of storytelling, and the fact that seeing things the way the Devil sees it might not be so bad.